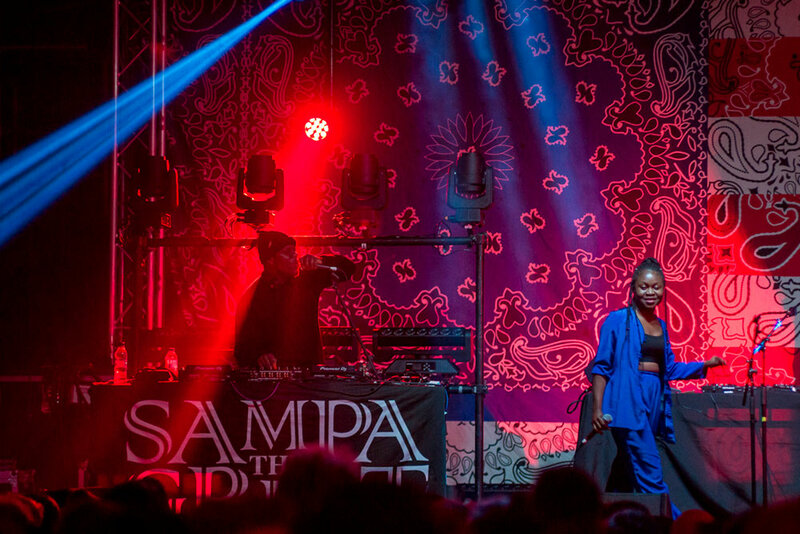 Sampa the Great, the creator of the Great Mix Tape and the Great Mixtape II which is due for release soon, was kind enough to take time off her busy schedule to talk to Chris from Art In Brighton on their 1BTN show about her tour, life at home and her upcoming plans for 2018. How are you Sampa? How’s the European tour? It’s amazing! It’s not the first time in the UK for me, having supported Joey Bada$$ on his tour but it’s the first time in Germany and France and all of these places and I’m going too just because of my music is just incredible. I remember the last time we spoke it was just before your date at The Great Escape in Brighton and you said your Dad still didn’t know that you did music for a living? Does he know now? Now he knows! (Laughing) He knows now because I told him I was going to Germany – “FOR WHAT? !” (Laughing). I’m doing music Dad, remember? Well, the beginning everyone kinda said: “What? You rap?” But now I’m doing it professionally they are asking how the show is, where I am, was it a good crowd? The kind of thing that usually my friends ask me and now my parents are asking me. It’s good now. Your new album The Great Mixtape II sounds a bit more traditionally Africa, was this intentional? I don’t know, the goal was to make the album sound more me, more like the sounds I used to hear when I was younger. Some chanting, harmonies and poetry and some rap in there too. I wanted it to be made up of sounds that are much more me and more unique to who I am. I think we got there, and from my friends people are saying it sounds more like me. Not to say The Great Mixtape didn’t, but this is much closer. Did the writing process change then? How did you ‘find you’? Rapping on beats is easy for me, I’ve been doing that since I was 10. Anyone’s beats I could rap over, but that would be their beat, so for this one I wanted to dive into more live music, making more beats from scratch and really find out how I express myself and my sound and then build on that. Did you work with a core group of musicians to help you find that? Jay, that’s Silent Jay, who does drumming for REMI [a rapper from Melbourne] he did Rhymes to the East which was crazy. Jay Jay [Alejandro Jay Abapo] also does back up beats and vocals for Hiatus Kaiyote, amazing artist, he did Bye River and more songs from the mixtape. And Kwesi/Blue Daisy produces for Black Acre, friends with my manager Carl who is also an amazing artist and it all just seemed to come together at a time when we were going into a month of writing and things came out of nowhere. With the poetry do you still work on it without using it over the top of music? I do, I do! I’ve been writing recently, just picking up a poetry book and just going in. Not all poetry has end rhymes and that’s why I love it. It’s why I love poetry as well, it’s just basic expression and when you’re constantly rhyming stuff just rapping to a beat you kind of forget about that free expression – so I still write on the side and still have the poetry books on the side and bring that to my music. That, chanting, singing and just straight up rapping and making sure they can all exist in the same project and I don’t have to choose a poetry project or chanting project, I can just do all of them in one – because that’s what also just makes me, me! How do people react to hearing your music for the first time? What I mean is it’d be easy to say you’re an Australian Hip Hop Artist, but really you have a lot of Spoken Word Artist that uses Hip Hop – does that alienate people or are people ready? Spoken word has always been in Hip-Hop I suppose it comes down to a labelling of genre, I don’t present myself with this huge veil over myself saying I’m this or I’m that it opens me up to more audiences and allows people to just find the music. They don’t turn away because it was made in Australia, or because it’s poetry or because I’m Zambian. If they feel the music, they feel the music and I don’t say I’m just this or this. Are there any poets that you really admire or look up too at the moment? At the moment, when it comes to poetry and literature – it’s mostly literature at the moment, particularly more novels – Toni Morrisson is quite amazing in the way she writes. I’m trying to read the way she writes and put that into my work. Telling a story and bringing them into the world of the story through their characters view. It’s just amazing writing to me. There’s so many though that I can’t just pinpoint, throughout all poets in my life. So you have 6 dates coming up at the time of recording, are you exhausted, looking forward to it being over or still excited? Still ready! There are so many first time shows, first time in Germany, first time in France it’s all very exciting and there’s so much to come I’m looking forward to the next few days. What can we look forward to for Sampa in 2018? So you’re actually going to make an album then? Oh man! Maybe. I mean I think it maybe definitely in the works in 2018. Well I can’t wait! Thank you so much Sampa for your time. You can catch Chris and Alice on the Art In Brighton show every two weeks on 1BTN from 8-10am. If you would like to feature simply email chris@artinbrighton.co.uk or alice@artinbrighton.co.uk.